I am writing on behalf of the Gary and Mary West Health Institute (WHI), an applied medical research organization and part of nonprofit and nonpartisan West Health, which also includes the Gary and Mary West Foundation and the Gary and Mary West Health Policy Center. Our organizations work together toward a shared mission dedicated to lowering the cost of healthcare and enabling seniors to successfully age in place with access to high-quality, affordable health and support services that preserve and protect their dignity, quality of life and independence. WHI supports key objectives of H.R. 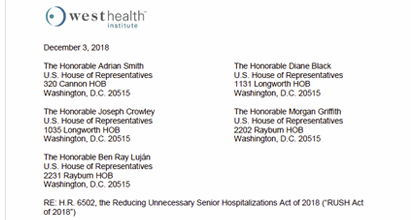 6502, which would allow the provision of defined telehealth services to Medicare beneficiaries at skilled nursing facilities (SNFs). We strongly support the goal of using telehealth as an effective way to lower the overall cost of healthcare by reducing hospitalizations and emergency department visits, while improving the quality of care provided to older adults in SNFs. Since its inception, WHI has championed increased use of telehealth. We have demonstrated through our research that telehealth is an effective way to lower costs while improving the patient experience. Among many applications, telehealth is a proven option for treating skilled nursing patients with acute or urgent changes in their condition, thereby reducing unnecessary emergency department use. We also support incentivizing SNFs to provide these services more easily to Medicare beneficiaries. It is imperative for the proposed new program to incorporate two-sided risk-sharing between the Medicare program and providers to drive fiscal and value-based accountability. Shared savings can be a powerful incentive to provide efficient care. Additionally, requiring providers to bear some downside risk has been a strong driver of innovation in care delivery models. This type of performance-based structure aligns incentives between payers and providers to lower costs and improve care. Thank you for the opportunity to provide our perspectives on H.R. 6502, and we sincerely appreciate your efforts on behalf of Medicare beneficiaries.